Texas Public Radio celebrates the season with holiday programming to get you into the spirit, or simply offer a moment of reflection. Join us on KPAC 88.3 FM, KSTX 89.1 FM, and all of TPR's TexNet stations for a cornucopia of programs, including music, spoken word, and in at least one instance... the inexplicable. Thanksgiving, November 22, noon, Giving Thanks: "Giving Thanks" offers a contemporary celebration of gratitude, with classical music and stories of Thanksgiving. This year's special guests include conductor Nicholas McGegan, who'll share an 18th century recipe for St. Cecilia punch to liven up any Thanksgiving celebration. Plus, we’ll revisit the poetry of former “Giving Thanks” guest and American Poet Laureate Donald Hall, who passed away this year. Broadcast made possible by Red Bird's House, Artisan Kitchen Towels. Did you miss the program? Hear it at this link. December 2, 4pm, Candles Burning Brightly Mindy Ratner hosts a new edition of this holiday favorite, in celebration of Chanukah, the Jewish Festival of Lights. "Candles Burning Brightly" explores Chanukah foods and traditional activities - and plenty of music. Did you miss the program? Hear it at this link. 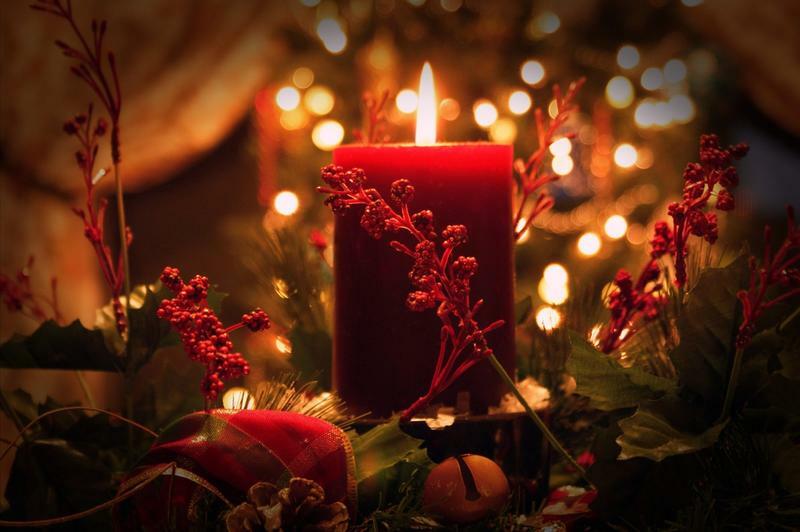 December 22, 7pm: A Service of Advent Lessons and Carols from St. Mark's Episcopal Church. Nathan Cone hosts this broadcast of readings and music, recorded live at St. Mark's Episcopal Church in downtown San Antonio, introduced by Rev. Beth Knowlton and organist Jon Johnson. December 24, 9am-11am: A Festival of Nine Lessons & Carols. Michael Barone presents this live service of spoken-word and music (choral and organ) broadcast from the chapel of King's College in Cambridge, England. The 30-voice King's College Choir performs the legendary Festival of Nine Lessons and Carols service of Biblical readings and music. December 24, 6pm: “Messiah” with the San Antonio Mastersingers: A performance of Handel’s “Messiah” with orchestra, recorded live at Shepherd of the Hills Lutheran Church on December 3, 2018. December 25, 9am: St. Olaf Christmas Festival This service in song and word has become one of the nation's most cherished holiday celebrations. The festival includes hymns, carols, choral works, as well as orchestral selections celebrating the Nativity and featuring more than 500 student musicians in five choirs, and the St. Olaf Orchestra. Host Valerie Kahler shares the sights and sounds of this choral favorite. January 1, 10am-noon: New Year’s Day from Vienna The Vienna Philharmonic presents its ever popular annual New Year's Day concert from the Golden Hall of the Musikverein in Vienna. You'll hear your favorite waltzes, polkas and more, conducted by Christian Thielemann -- a festive way to start off the New Year! Presented by NPR Music. Broadcast made possible by Texas Hill Country Opera. Sunday, Decemeber 2, 3pm: Hanukkah Lights 2018: A perennial NPR favorite with all new Hanukkah stories. Authors TBA. Hosted by Susan Stamberg and Murray Horwitz. Did you miss the program? Hear it at this link. Saturday, December 22, 7pm: Christmas in Jazz, TX Join Nathan Cone and Doc Watkins for some swingin' holiday classics, recorded live at Jazz, TX, in the heart of the Pearl Brewery in San Antonio. Or.... hear it now in the player below! Monday, December 24, 10pm, A World Cafe Holiday: Hear special one-of-a-kind holiday performances from big-name artists including Jack Johnson, Carole King, Sharon Jones & The Dap Kings, The Oh-Hellos and more. Hosted by Talia Schlanger. Monday, December 24, 11pm, Peabo's 18th Annual Holiday Adventure, "Peabo Gets A Job": For some reason, TPR's oddest holiday tradition continues! Now in its 18th year, Peabo the rooster joins hosts Nathan Cone and David Furst for an unforgettable Christmas adventure filled with merrymaking and much music. Tuesday, December 25, Noon, Tinsel Tales from NPR: Hear a collection of extraordinary Christmas stories that will transport you to unexpected places. NPR's past and present tell stories of the season in this hour-long special. Some tales are funny; some are touching; some are insightful or irreverent or nostalgic or surprising. You might recognize them from our broadcast archives — or you might fall in love with them for the first time. Hosted by Lynn Neary.